Swiss Chard is a vegetable relative to beets. The leaves of the beets and the chard is similar, however the leaves of the chard is more flavorful and nutritious, it is slightly bitter and salty. 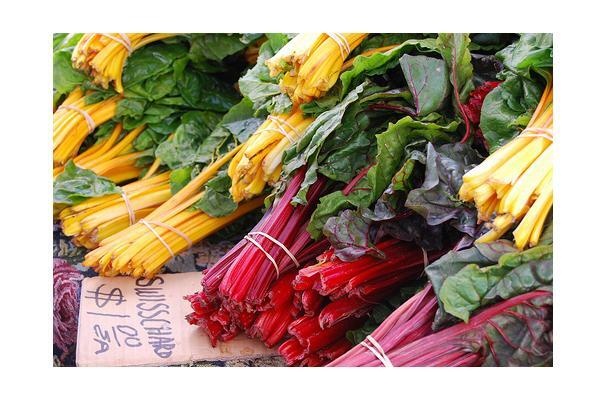 Chard is rich in dietary fiber, magnesium, calcium, Vitamins A, C, E and K, potassium, zinc, copper and folate. Another super food that everybody should be eating. It can be steamed, roasted, and sauteed. Swiss Chard is a dark leafy green vegetable with bright colored stems in red, yellow, orange & green. The leaves are large and elongated. Both the stems and the leaves can be eaten. Colors: dark leafy green vegetable with bright colored stems in red, yellow, orange & green. Choosing: Look for firm upright leaves and stems that are free of brown spots. Buying: Swiss chard is available at all grocers and farmers markets. Cleaning: Simply rinse the leaves and shake off the excess water and trim the stalk ends.